• Buffered C Plus capsules contain a non-acidic, calcium ascorbate form of Vitamin C.
• Vitamin C (ascorbic acid) has numerous biological functions. It is essential for the synthesis of collagen and glycosaminoglycans, which are the building materials of all connective tissues, such as skin, blood vessels, tendons, joint cartilage and bone. • Vitamin C participates in the biosynthesis of carnitine, serotonin, and certain other neurotransmitters, including norepinephrine. 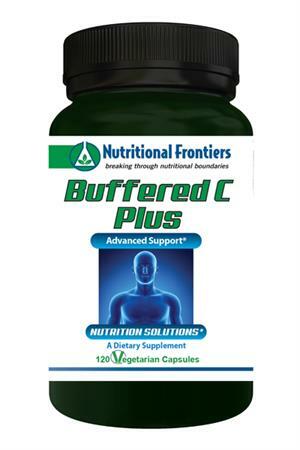 • Vitamin C is among the most powerful antioxidants in humans and animals. It is a water-soluble, chain-breaking antioxidant that reacts directly with superoxide, hydroxyl radicals, and singlet oxygen. Vitamin C interacts with glutathione and alpha-lipoic acid, and regenerates Vitamin E. The antioxidant functions of Vitamin C appear to have clinical significance in providing protection from free radical damage to the eyes, lungs, blood and the immune system. Other Ingredients: rice our, vegetable stearate, hypromellose, water.